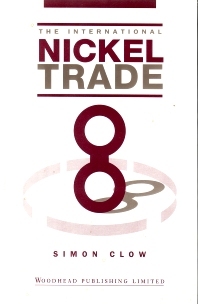 Nickel is an internationally traded commodity and the smallest of the LME's six base metals contracts. Its unique characteristics allow a variety of commercial and industrial applications, the most important of which is undoubtedly in the production of stainless steels. Simon Clow has set out to paint an overall picture of the nickel trade; the result is a book which genuinely covers the entire industry. It describes the history and growth, defines areas of production and explains the mechanisms of demand and consumption. Above all the book is concerned with patterns of supply, with prices and with attitudes towards different pricing mechanisms. History of the nickel industry; The production of nickel; The consumption of nickel; Major Western nickel producers; The geography of world nickel supply; Nickel trading; Politics and nickel; Prospects for nickel supply and demand.